Personal transport is ready... Are you? Are you looking for something different? Then the PGT may well be the answer. The PGT gives you the freedom to virtually glide around any modern day golf course with ease. It is a personal transporter that is designed to carry a single adult and full set of clubs effortlessly with the minimum of fuss. The technology allows you to simply stand on the platform and gently lean in the direction you would like to go and at a speed that suits. When you arrive at your location, just step off backwards and everything comes to a stop. Position the PGT so that your clubs are vertical and you are ready to continue your golf. Moving off, place your club into your bag and step on to the platform and gently lean forward and the PGT will gently move away, what could be simpler? 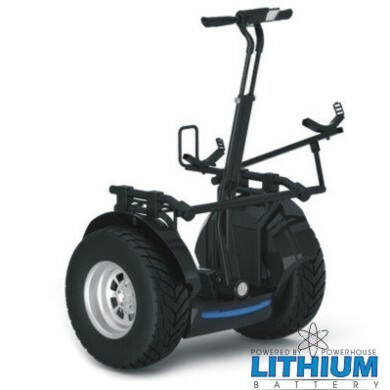 The PGT is powered by 48v twin LiFePO4 Lithium batteries. The PGT has on board charger so just plug in the lead into the mains and leave to charge. Full charge takes in the region of 6 hrs. So it won't be long before your back on the fairway. Gyroscopic technology makes the PGT appear motionless whilst you are stood on it, waiting for your command, so no special balancing skills are needed. Keyless entry system provides you with a machine that requires no keys to operate. The small LCD module can fully programme all aspects of the PGT including the on/off functions. When not in use the module just lifts away from the dashboard and taken away just like a conventional set of keys. The PGT cannot be used in any way without it, (that is why 2 modules are supplied as standard. 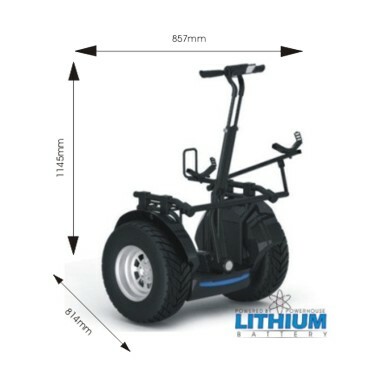 In line with Powerhouse Golf Lithium batteries, the PGT uses LifePo4 as standard. 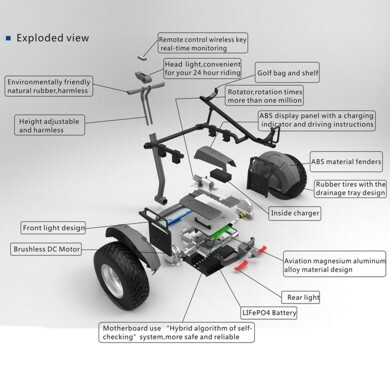 Guaranteed for 12 months and will propel you around any modern day golf course on a single charge*. The PGT is fitted with 20" treaded tyres on superbly designed aluminium wheels. So should the mood take you, you can transfer from the golf course, to the beach, to woodlands and any off road situation that takes your fancy. The PGT comes with everything you need. Even a seat option is available. The only thing you need is the confidence to try something new and give yourself the freedom, personal transport can offer. At Powerhouse Golf we offer a wide variety of accessories suitable for the Powerhouse PGT.